Stimulate your skin with antioxidants that aid in the fight against environmental damage. Together Nano-Platinum, Trehalose and Pomegranate have some of the highest antioxidant and free-radical scavenging capabilities. This face masks provides an instant lift and long-lasting firmness for nourished, firmer and beautiful skin. 1. Cleanse Skin, 2. 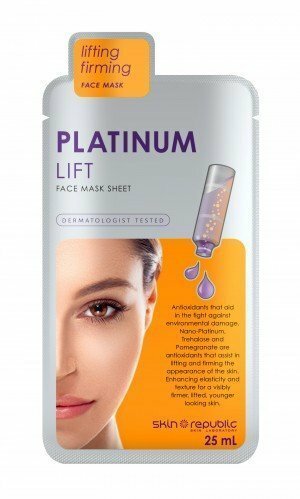 Remove mask from packaging, unfold and place onto face. 3. Wear for 15-20minutes. 4. Remove mask, no need to rinse. 5. Massage excess serum into face , neck and hands. 6. As the skin has a 4 week regeneration period, it is most effective when used twice a week for the first month and then as required.